I finally made spaghetti and meatballs! One of my biggest challenges as a low FODMAPper is cooking Italian food. I am Italian, and it’s the food I know how to cook best. I’ve been eating it 4 times a week my entire life, and while I’d found a decent substitute for jarred pasta sauce, and a great substitute for pasta, I wasn’t sure how to tackle my beloved bolognese sauce. My bolognese sauce is a family recipe, passed on through the ages. It is loaded with garlic and onion, and I’ve missed it. 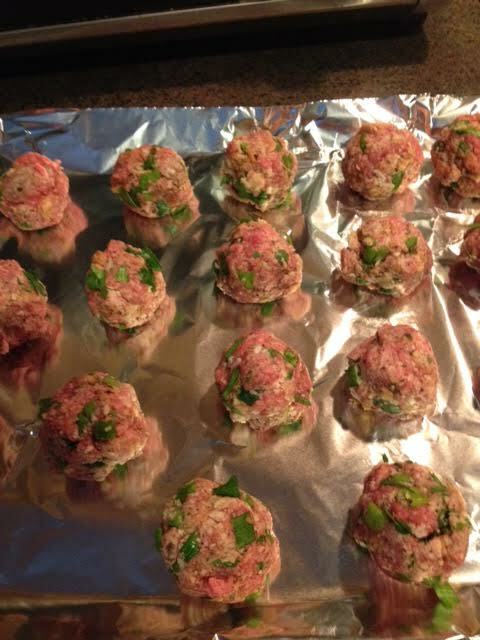 This weekend, I decided to make low FODMAP meatballs from Low Fodmap Ninja, and attempt some sort of bolognese. 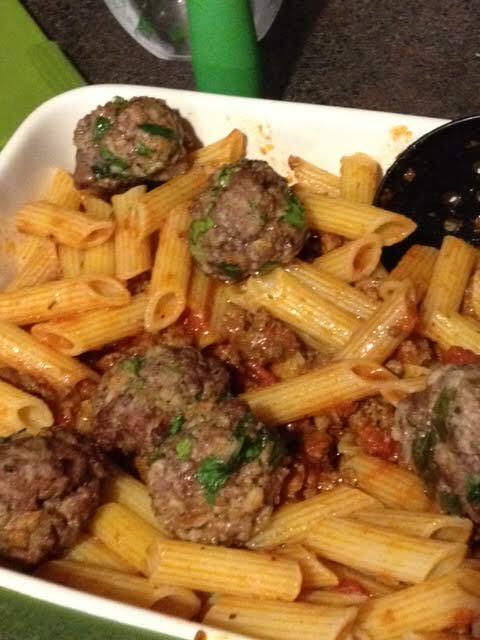 The meatball recipe does have milk in it, but I do not have a lactose or casein intolerance, so I used it. Soak bread in the milk until soggy, about 5 minutes. Squeeze the milk from the bread and combine with all other ingredients. Break up the bread into small bits while mixing. Shape mixture into 1-inch balls (about 1 rounded tablespoon), pressing no more than necessary. Important! – don’t make the balls too big. Place meatballs on ungreased baking sheets. Bake 7-8 minutes until no longer pink on the inside. Rather than using two different meats, I just used 1 lb. of ground beef. I cooked the meatballs for about 11 minutes, and put foil on the baking sheet for easier clean up. They were really good, and I have a ton left over for future meals. I had some meat leftover from the package of ground beef, and decided to attempt bolognese. I sauteed some cut chives in olive oil, added the beef, threw in salt, pepper, and italian seasoning, and stirred it until the beef was brown and crumbly. I then added Rao’s Sensitive Spaghetti Sauce, and some additional Italian spices. It was really bland compared to my usual bolognese. I need a little more tweaking to make it almost as good as my family version. This week has been a good low FODMAP week! I made a concious decision to avoid all gluten because I really wanted to eat pizza this weekend, and my recovery from gluten was much quicker and less painful. Any have some bolognese suggestions to share? I already plan on adding Italian sausage and garlic infused olive oil to my next batch….